Hello Sunday and yes, I’m having one of those lazy ones. I wanted to share this very quick and easy recipe with you though, it’s actually perfect for lazy Sundays. 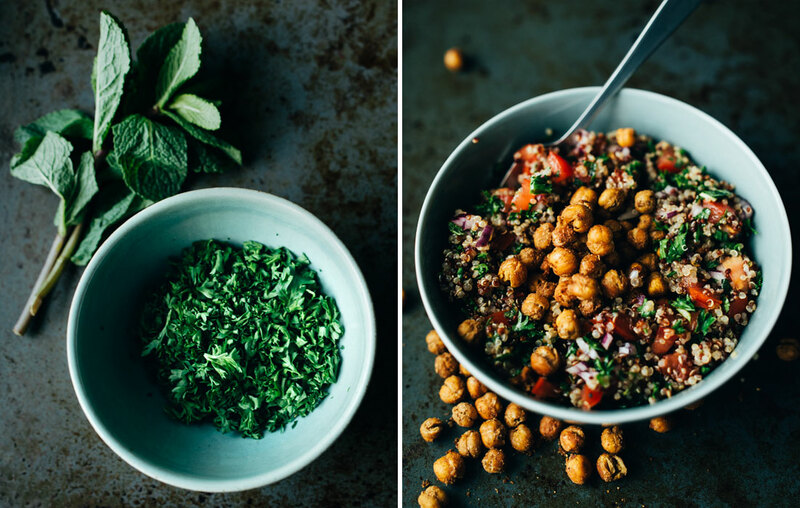 I’m sure most of you have had tabbouleh before and maybe even a version with quinoa but here is my version and I love to have it with crunchy roasted chickpeas so at least I hope I’ll be adding that to your tabbouleh experience. The recipe is not just good for Sundays but it’s pretty lovely any day of the week, great for leftovers and a fantastic pic nic addition. I have also tried to make this in a raw version with grated cauliflower instead of quinoa and it worked a treat. Although it might be a good idea to press excess water out of the cauliflower using for example a muslin cloth before mixing with the other ingredients to avoid tabbouleh soup. It does still work without pressing but if you’re keeping it for another day you might get a lot of water in your bowl. I do know people who like to drink their leftover salad dressing though and I say each to their own, haha. Now I’m off to cuddle with my sister and her three Afghan dog babies (not really babies anymore, but you know what I mean). I’ve landed in the idyllic Swedish countryside and I’m pretending that I never have to leave! Place rinsed chickpeas on one half of a clean tea towel and fold over the other hald to pat them dry. Remove any scaly skins and place on an oven tray. Drizzle with olive oil and scatter with cumin, sea salt flakes and black pepper. Mix with your hand until chickpeas are coated and place in the middle of oven for 30 min or until crisp and golden. Rinse quinoa and add to a small sauce pan with the water and tamari. Reduce to simmer until all liquid has been absorbed, about 15-20 min, and then uncover and fluff the quinoa with a fork letting steam evaporate. Meanwhile chop onion, tomatoes, parsley and mint leaves very finely and mix together in a bowl. 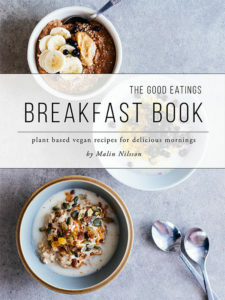 When quinoa has cooled of a bit add it to the bowl along with olive oil, lemon juice, sea salt flakes and black pepper. 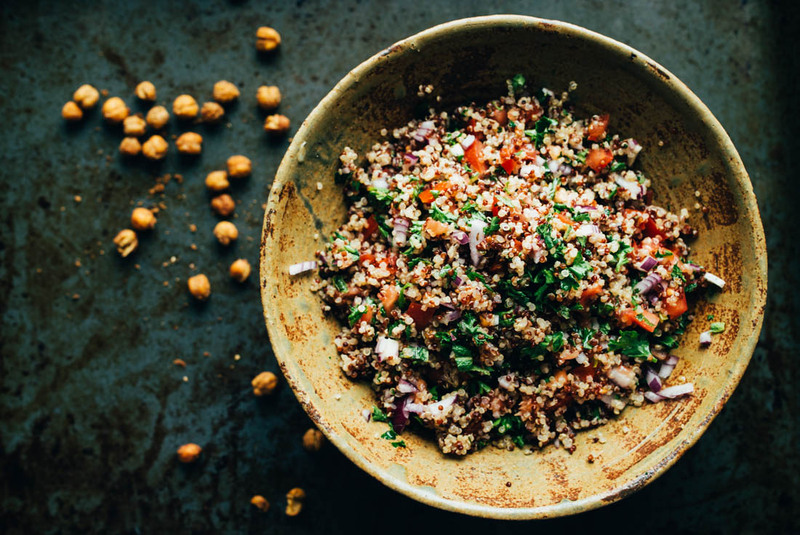 Mix and serve topped with crunchy chickpeas. thank you very much Anna, this put a big smile on my face! Thank you so much Sarah! Have a wonderful weekend!